Leading Manufacturer of hydraulic press for silver coins & bars from Ahmedabad. 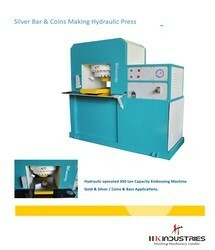 This hydraulic coining press is specially desgined for Silver Industries for making Coin & Bars. The Machines is fully hard structred based with having double working piston for making upto 1000 grams of silver coins and bars in one shot stamp. It is equipped with hard base plate and has the highest possible working forces for ensuring opimum in minting the coins and bars. Our company provides whole setup of coining machiney an d is the only manufacturer in india which makes all in its own production factory. please ask for more details or visit us in our factory located in Ahmedabad City.